The Soft Fruit of Doom! This is like a heavily pumped up version of the Cluster Bomb. After the Banana Bombs fuse burns down it splits into six Banana-Bomblets, which shower the landscape and cause mass devastation. Watch out though, if you aim this high into the air there is a chance that the bombs will spread out far enough to damage one of your own Worms. Each of these bombs can cause up to a maximum of 75 points of damage each. If you want to inflict an insane amount of damage on your opponent but don't mind sacrificing a Worm in the process you can try this out. Place the Banana Bomb directly on top of your enemies head, just before the bomb is about the explode do a vertical jump. 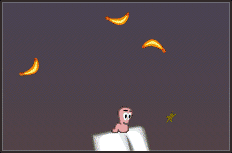 All the Banana-Bomblets will explode instantly as they hit your Worm and this will consume a stupid amount of health from your enemy. A good measure against those players who collect every health crate they see!